time to go back to school, kiddies! weekday matinees are so much nicer with no bratty kids around!!! Grease is the best musical and movie ever made it is absolutely fantastic!!! =] -MaRiTzA!!! Grease is my all time favorite movie. Grease IS the word!! 52 thumbs up!! Grease is amazing, i can`t believe it`s still popular!!!! I like it a lot. I`ve seen it a thousand of times.We did a play at my school. I thought this movie was really well done. this is one of my altime favorite movies. I love the clothing. I can watch it allday long an neva get tired of it. I think the first one was way better than the second one. If they r goin to have a sequal than use the same pl as before. I LOVED IT ! IT WAS THE BEST MOVIE EVER ! BUT I HATE GREASE 2 . GREASE IS STILL THE WORD!!!!! i love the movie grease!! ui have seen it 50 times since the time i was 3. i saw it for the first time in 1997 in theaters. i was little at the time so during every song, i would get up and dance. i think that it is one of the best films ever made, and the soundtrack is totally awesome 2!!!!!!!!! It was so good i can`t stop watching it i`m obsessed with the music and the movie. this is the best movie of all time!! :D :) i am 15 and have been watching it scince i was about 8! i love it s0o s0o much! The music is great too!! WAS DA BEST MOVIE OF MY LIIIIIIIIIIIFE!!!!!!!!!!!! Well I watched it 5 times and all 5 times it was fun like heck! My boyfriend made it funny by singing along to the better songs * he`s a singer so it sounded awesome* Anyways I`m 13 and I think it`s the best movie ever made! I thought it was absoulutally brilliant!!! Five stars!!! 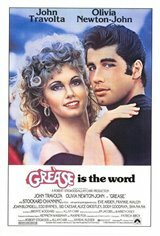 My daughter`s high school will be doing this production ..after viewing what GREASE is about and the songs, I am SO disappointed in the director`s choice. There are much better musicals out there than this ! i have seen grease so many times that the tape to my video broke, that`s how much i love that movie. the musical movie i have ever seen. I have seen grease many times...and it always feels same...i mean cool !!! The thing is...i´m from Finland...!!! AND OF COURSE... I LOVE JOHN TRAVOLTA IN THAT VIDEO!!! we thought it was great! ~**GREASE**~ THE BEST MOVIE OF ALL TIME...WITH THE BEST CAST...THE MUSIC, DANCING, AND ACTING IS ALL SO GOOD!!!!! !GREASE IS SO AWESOME!!!!!!!!!! Grease is the best movie of all time!!!!!. It`s hilarious and is a classic movie that will be remembered forever. GrEaSe is sssssssssssoooooooooo awsome i love it so much and one of my fav songs is GREASED LIGHTNING. As a matter a fact i love grease so much that this year 2004 i am in the school play that is GREASE. .... Grease is definetly the word... almost 30 years later and it is still a classic... i just wish i could i have been in that movie...i wish we had those kinds of days now...the old fashioned kind...i would have loved it... great job on grease... and keep spreaden the word... and dont forget that a hickey from kenicky is like a hallmark card...good enough to send the very best!!!!! Now grease is a classic. I just never agreed with teh ending. Shouldn`t good girls always be good? where`s the morals? the best film ever i watch it every day!!!!! !